Being a part of a long-term relationship comes with its own emergence of patterns over time. It’s an inevitability bound by discoveries that occur as you get to know someone. Sometimes it shows itself in who does what chore, who drives more often or who needs to be the one controlling the remote. In my relationship, the biggest patterns can be seen in the way we eat because that is what we tend to be doing together the majority of the time whether it is out in the restaurant world or cooking together at home. For example, most of our first few minutes at a restaurant consist of the same ritual. I scan the menu picking out the four or five items I would choose and then he decides what he wants knowing that he is going to be the recipient of half of my dishes in the end. This means our orders never duplicate and then he is tasked with picking the wine, having the better nose of us two. 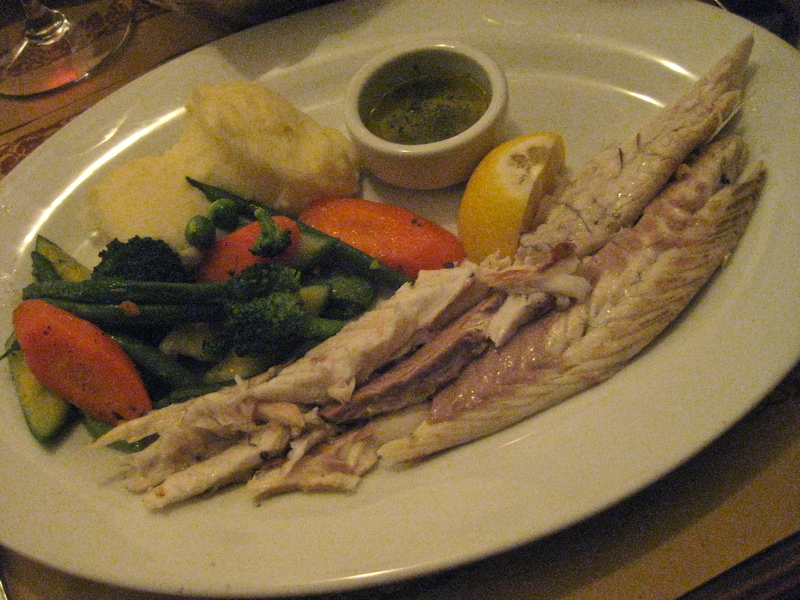 When it comes to Italian restaurants we tend to follow a similar groove of our own making. I can’t really get through a full meal of antipasti, first, second and third courses so we typically share a starter and then I get a pasta course and he gets an entrée, thus he eventually gets the fruits of the whole full course meal while I get a few bites of each. But the beauty in patterns is that once in a while they are broken by a special circumstance. This past Friday we shook it up a bit at Chef Gino Angelini’s Angelini Osteria because of a variety of things. For one, I had heard that the whole idea of an old Italian osteria was to provide a place where people of all income brackets could come together to enjoy a leisurely meal over wine. A precursor to the bar, it was a place where people could burn off the workday over a pack of cards and flowing dishes of food. Having been privy to Italian restaurants over the past year that have become so Americanized as to rush the food in efforts to table turn, this was something we were looking forward to enjoying in proper time. 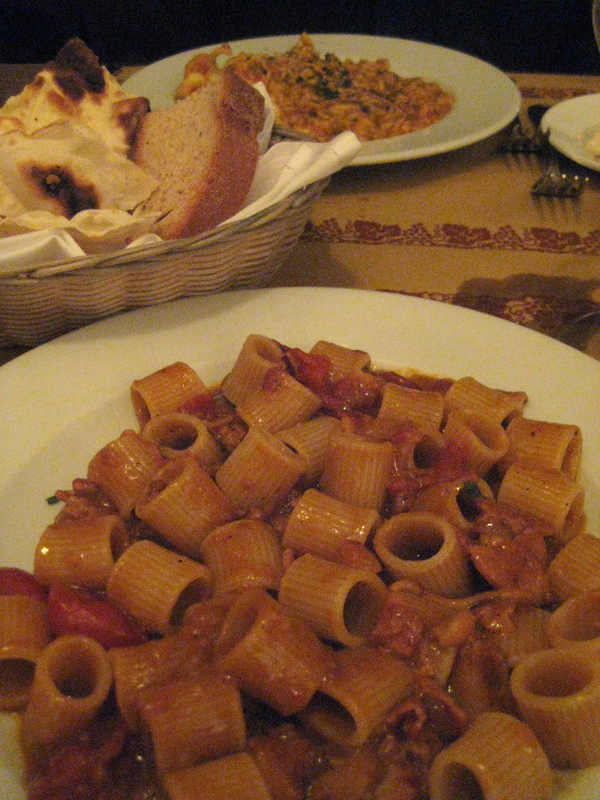 Lastly, we had heard that Chef Angelini’s specialty was meat tempting us away from our typical experience of eschewing the meat dishes that are always all too ordinary for us in lieu of exploring new pasta combinations so we were anticipating dual meat entrees. Located on Beverly Blvd. and squished into a small, rectangular dining room warmly constructed of modern concrete, high ceilings and low lit wood furnishings, it lived up to its populace concept by placing diners nearly elbow to elbow while the savvy servers wheeled shank laden serving carts table side to serve glistening slices of roasted lamb, veal and beef. Also off the track of trendy Italian joints in L.A. the portions were generous as my perfectly al dente bombolotti came filling an entire plate and spiked with plentiful slivers of guanciale laden with the spice of red peppers. The flavor combinations were bold and creative reminding me of why I enjoy ordering new variations on pasta. The Cute Gardener’s seafood risotto indeed tasted fresh from the sea and not muddled by too much cream as is often the case. 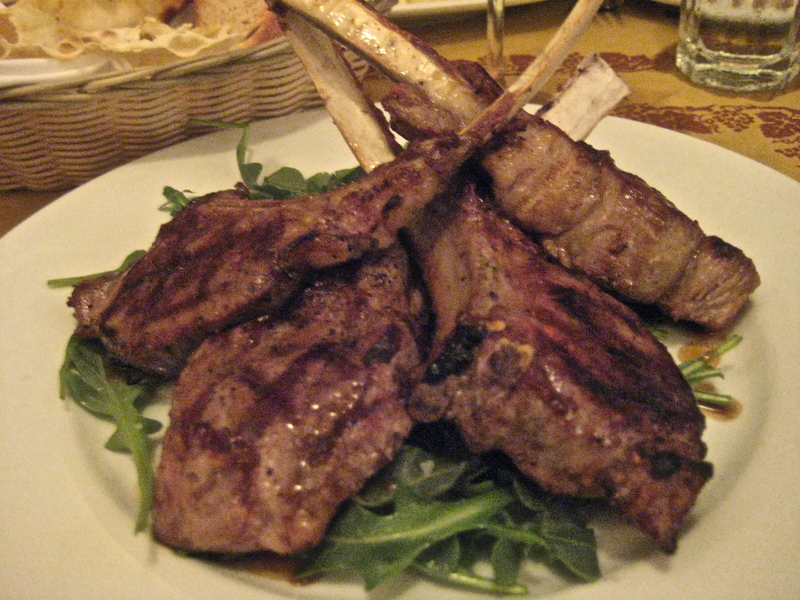 My lamb chops were cooked perfectly as in there was no distinguishing between the fat that lent the overall flavor and the meat which in its tenderness showed an excellent touch from the kitchen. There were four of them on the plate on top of a peppery arugula salad; savory in their simplicity as all good meat should be without accoutrement. 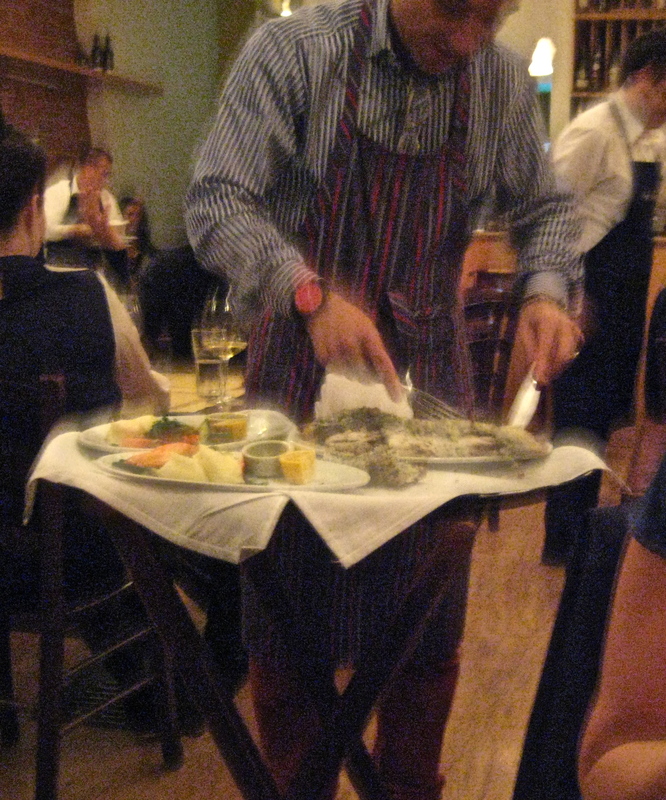 The branzino, which was brought to the table and cracked from its salt encrusted shell, was creamy and hearty unlike the branzinos I’ve had of late at lesser joints arriving stringy and beneath a gummy skin. 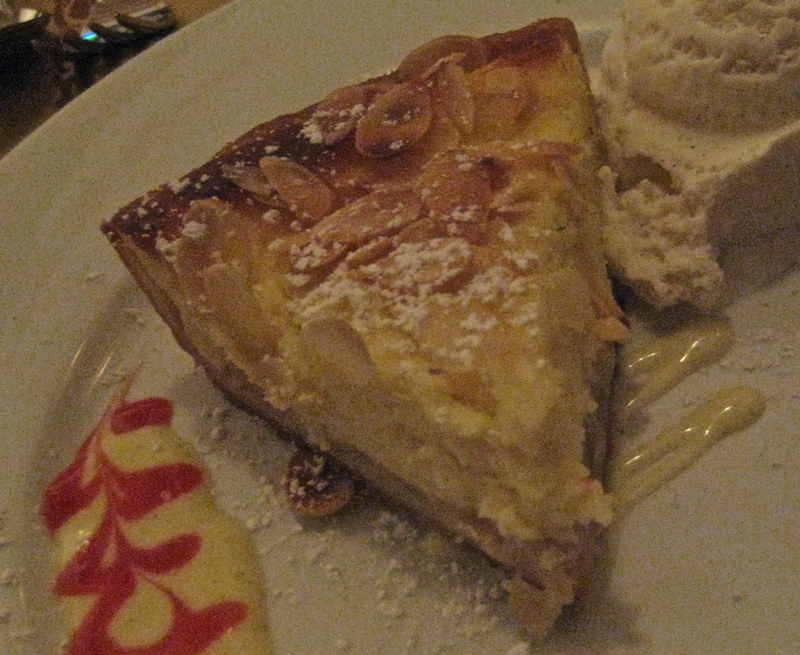 The ricotta cheesecake dessert was balanced and not cloyingly sweet, only getting a hint of sugar from the sublime slivered almonds. We stayed there longer than we are used to and it was because the dishes arrived in good time and were delicious enough to warrant savoring. The lively atmosphere in the place was like all good places where people converge and fall into a relaxed state without feeling hurried to leave. Although I didn’t get to enjoy a pack of cards with strangers, we did go home and play billiards for three hours to work off the satisfying meal. This entry was posted in Eating Out and tagged angelini osteria, beverly boulevard restaurants, bombolotti, branzino, chef gino angelini, Cute Gardener, Kimberly Nichols, Los Angeles Italian restaurants, Unorthodox Foodie by unorthodoxfoodie. Bookmark the permalink.